It happened over a week ago, in the middle of the plague that hit my house and an accompanying snowstorm, so the timing was far less than optimal. By the time the kids left for their father's house last weekend, I was standing on a mountain of dirty laundry and it needed to get done. I managed to locate a Laundromat – which is a lot harder than you'd think nowadays and you don't live in a major city or a college town. It was twenty minutes up the road, and I figured what the hell – at least I can get it all done at once, and maybe get some writing in while I was waiting for it all. So I loaded up the laundry baskets and a hamper into the car and off I went. 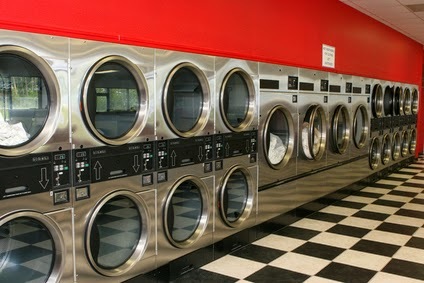 I haven't been to a Laundromat in decades.I haven't missed it, either. When I got there on a Saturday mid-morning, there were a few people hanging around. There was a girl in her twenties, and what looked like a single dad with his young son. The place wasn't big, and the strip mall it sat in was mostly deserted. It was clean enough, though. I gave them all a friendly nod, loaded up my machines, opened up my laptop and settled in. Laundry Dad and apartment girl cleared out fifteen minutes in, and I moved my stuff into the dryers, wondering how it was that I was already down $17.50 on five loads of laundry before I'd even dried the stuff. I settled in once more with my laptop, and the door opened, and a lone guy came in with a basket of laundry. He busied himself for a few minutes, and then one of my dryers finished, and I had to close up the laptop and get to work folding, so I did. Oh, how I simultaneously hate and love when strangers talk to me. I'm an introvert by nature, so my first inclination is to wish them to perdition and refuse to make eye contact all while keeping my answers short and polite. But then again….I'm a writer. I love stories, and people tell stories. I love to hear people's stories and if there's one thing I've learned it's that sometimes, people's stories can come out of the most unlikely places and be far more than you expected them to be. So I make it a point to be polite and blandly friendly when a stranger talks to me, so as not to shut them down immediately, but as the conversation goes on, I reserve the right to keep it short and sweet and get the hell out of there if I need to. And Saturday, I needed to. Because this guy? This guy wasn't conversing to pass the time. He was trying to pick me up. And here's the problem….he wasn't being terribly creepy. Just sorta…borderline. He wasn't a scary looking guy. And of course the answer to all that was no even though it's not really but I was trying to stay polite and not encouraging. He wasn't getting in my face and he wasn't saying anything terribly creepy. He was just an obviously single guy who saw an equally single girl and thought he'd fire an arrow and hope it hit a target. I get that. But I was also all alone with the guy, and he was between me and the door. I don't think I've ever folded laundry as fast as I did that morning. I finally got the last basket loaded and he asked me what my last name was (and I made one up, because God forbid I appear rude to the guy who was making me uneasy). I left after once more telling him I had a boyfriend (when he asked me to give him a shot). I slid behind the wheel of my car and I locked the doors and I let out a sigh. And then I drove around the block and through the parking lot of a busy grocery store to make sure nobody was following me even though I hadn't seen him leave the Laundromat. Because that's what we women do. What we feel like we have to do. Especially after a guy hits on us in an empty Laundromat and still won't take no for an answer entirely, even after you tell him about your made-up boyfriend. He may have been a perfectly normal guy. Maybe a little too forward, but no more so than a few dozen drunken frat boys I dodged in my college days. He wasn't touching me. He said nothing innately threatening. It just was threatening, because I was alone with him, and he was between me and the exit, and he was an unknown. This is the world you live in as a woman, when you have to worry about being raped and/or murdered while doing your laundry, all while second-guessing yourself because he may be a perfectly okay guy and you're overreacting. It ain't easy being a girl. Ellie, I read your blog regularly but have never commented before, and I think you're great! This post really resonated with me. Yesterday I had a similar experience with a guy in a van slow following me and ask me repeatedly where I was parked. It turned out he just wanted me parking spot, but it's very unnerving. I would strongly suggest reading the book "The Gift of Fear", it would be a great read for your daughter as well. It's written by a man who heads a large security firm, and it talks about how our intuition and guts give us everything we need to survive a crisis. It also talks about how women ignore those feelings because we are conditioned to be "nice", and how to learn to hear and trust them. Anyway, it really was helpful for me. I'm in no way affiliated with the book or author, I just think it's a valuable book for women. Anyway, keep writing and good luck with your YA novel!